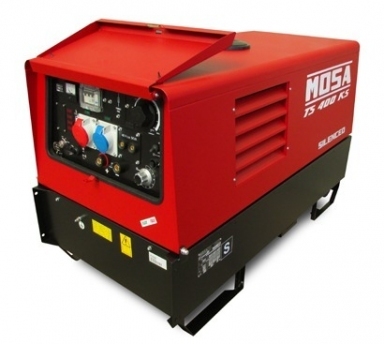 637 - MOSA TS 400 KSX/EL - საკის გენერატორები | GENERATOREBI.GE | ჩვენთან ევროპული ხარისხია. TS 400 KSX/EL Diesel Engine driven welder - KOHLER KD 625/2 Engine - Three-phase asyncronous alternator - Three-phase generation 13 kVA - Single-phase generation 7 kVA - Max welding current: 400A The engine-driven welders TS 400 KSX/EL are professional machines with electronic control of the welding current capable of delivering up to 400 A with a duty cycle of 60%. diameter. Suitable for a wide range of uses including mobile welding, site fabrication, maintenance and pipeline construction. In according with CE regulation.